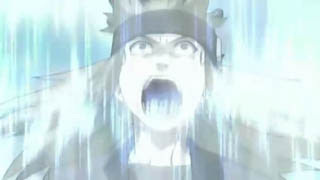 Yukimaru is a young boy (it is still unknown if he is a shinobi) who appears in the second Naruto Shippuden filler arc. He is a test subject of Orochimaru, because he has the ability to control the Three-Tailed Giant Turtle. Yukimaru is a quiet boy, probably due to his past, he constantly ask questions like "Is it going to be fun?". His main goal is to find home and is told by Naruto that home is a place where people think about you, which lightens his spirit. Yukimaru always telling that he has no home to go to. 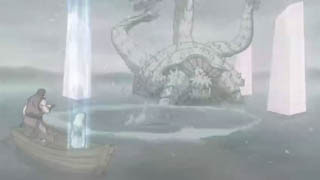 Later on Kabuto sets off together with Yukimaru for a journey. They eventually arrive at a dark swamp. There, Kabuto conducts an experiment where he forcibly releases the full power of Yukimaru's chakra. This results made the Three-Tailed demon to partial emerge before submerging again. Later, he is sent out again with Guren to complete a mission. During which, he succumbs to sickness, forcing Guren to care for him. As a result, he seems to have grown attached to Guren and possibly vice-versa. This is further emphasized from how Yukimaru reacted when Guren tells Yukimaru she has to head out in a manner similar to how Yukimaru's mother did before presumeably dying. He then gives her his necklaces with a special charm on it. Later, Yukimaru again bumps into Naruto, who offers for the orphan to join him in Konoha, to which Yukimaru politely declines as he feels his place is with Guren. Soon after, Kabuto returns to conduct another experiment with Yukimaru. He has Yukimaru take several medical pills. Ultimately, this finally causes the Three-Tailed Beast to emerge. He is able to controlled three-tailed beast, for the first time he has to drink the pills from Kabuto to release Three-Tails Chakra but later he manage to release it without pills. 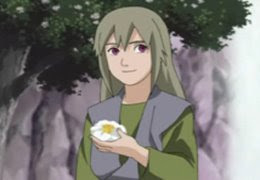 Yukimaru also has illusion technique, when he meet Naruto, white camellias appear on everywhere. Then he and white camelias (tsubaki) disappear on the same time.